Feel the Gold Rush thrill and claim your (up to) $150 welcoming bonus Play Now! Battlestar Galactica is an ideal video slot for sci-fi fans to play at Microgaming casino sites. Since releasing in December 2012, the Battlestar Galactica slot has given fans of the hit TV series a game that is dedicated to their passion. Alongside the official licence, the slot carries a number of functional strengths. Although released in 2012, Battlestar Galactica has definitely aged well, given that the slot largely depends on images from the TV show and doesn’t get unnecessarily ambitious with the graphics. Notably, each character can become animated if they deliver a win for the player. When it comes to the technical aspects, Battlestar Galactica has been built with the aid of five reels and three rows. Therefore, players can see 15 symbols with each spin and there will be 243 ways of winning for a slot that boasts a 96.60% return to player (RTP). The wagering is pretty much standard for a Microgaming slot, what with players able to assign coins at €0.01, €0.02, or €0.05 each. Above that, Battlestar Galactica allows for anywhere from one to ten coins to be wagered, meaning that each spin can range from €0.30 right up to €15.00. • Ranking: gain ranks and improve in order to unlock fresh content for the gaming experience. Wagering more can cause players to rank up quicker. • Stacked wilds: Battlestar Galactica logo can appear stacked on reel one. • Free spins: landing three spaceships on the screen can deliver 15 free spins. • Ion Storm: turns up to five reels wild and triggers at random during play. • Run Mode: begins randomly and can see all wins paying both ways. Mystery symbols also have a chance of appearing. • Fight: a random mode that can turn symbols wild and split wilds in half. Up to five free spins can also be gained. Battlestar Galactica has been designed for fans of the show, but is well worth trying by most players at Microgaming casinos online. 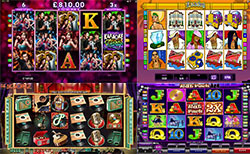 Not only is the slot mobile-compatible, but it also provides the chance for a €70,000 jackpot and to unleash a variety of impressive special features and rewards.